Dr. Azita F Moalemi, MD is a Doctor primarily located in Springfield, VA. She has 27 years of experience. Her specialties include Cardiovascular Disease and Internal Medicine. She speaks English. Dr. Moalemi has received 7 awards. The overall average patient rating of Dr. Azita F Moalemi is Excellent. Dr. Azita F Moalemi has been rated by 156 patients. From those 156 patients 116 of those left a comment along with their rating. The overall rating for Dr. Azita F Moalemi is 4.8 of 5.0 stars. Dr. Moalemi is a very compassionate doctor who listens to her patients. As a consequence, the wait times are incredibly long. I’ve waited for over an hour to see her. It’s uncomfortable and cold to sit in the waiting rooms staring at the walls. Additionally, Dr. Moalemi takes the time to answer your questions but I wish she volunteered more up front instead of me being forced to pull out the information. I think she’s perhaps spread too thin with the large numbers of patients she sees each day. Outstanding Cardiologist, I would trust her with my life and do! Dr. Moalemi is wonderful. I would strongly recommend her. Just make sure to allow at least 2 hours for your appointment - that is after you get to the exam room. My appointments have never started on time and I usually spend more then half an hour waiting in the exam room. Dr. Moalemi is a wonderful, caring physician. I have been a patient for over 9 years and consider myself so fortunate to be under her expert care. Her practice is welcoming, efficient and highly professional. I, and my family, trust her and know she is truly committed to our health and we'll-being. 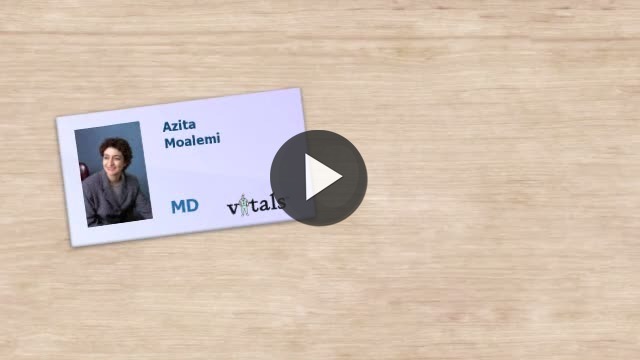 Take a minute to learn about Dr. Azita F Moalemi, MD - Cardiovascular Disease in Springfield, VA, in this video. Dr. Azita F Moalemi is similar to the following 4 Doctors near Springfield, VA.
Have you had a recent visit with Dr. Azita F Moalemi? Select a star to let us know how it was.